Danish twocoloured plate with EU-sign - almost the same size as the original - same length, but lower height. 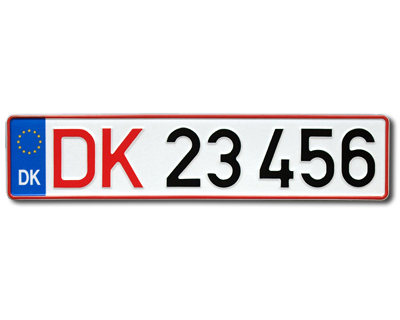 The numberplate is made of reflective white aluminium with the danish blue EU-sign and has a red frame. The 2 letters are in red and the 5 numbers are in black. Size 503 x 110 mm. Max 7 embossed characters. Please check out our fonts before ordering, they are not the same as the danish fonts! Our plates are designed for show use only, it is not allowed to use Showplates as license plates! The price is for one piece. For further questions please email to: info@showplate.se Please write the text in the comment field little later on.